Applying pesticides correctly involves diluting the product (except ‘Ready-to-Use’ formulations) to the appropriate concentration and using calibrated application equipment. This module is designed as a guide for the proper dilution and application of pesticides. It includes practical calibration techniques for common pesticide application equipment. Much effort was made to keep the text brief and provide an abundance of examples. 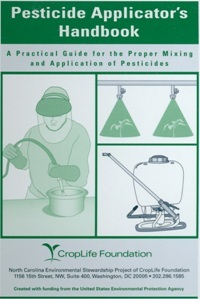 Text and illustrations in this module are derived from a 70-page booklet entitled “Pesticide Applicator’s Handbook”. For ordering information, send an e-mail message to wayne_buhler@ncsu.edu with the words “Pesticide Applicator Handbook” in the subject line. Dr. Wayne Buhler, Professor, North Carolina State University, served as the Technical Reviewer for the “Pesticide Applicator Handbook” and compiled the information in this website. Appreciation is expressed to Dana Babbs, Greg Miller, Sandy Shultz, Brenda Bunch and Grace Jenkins for help with the graphics presented in this module.